onions are an outstanding source of polyphenols, including their hallmark flavonoid, quercetin, which helps provide antibacterial and anti-inflammatory benefits. Sulfur compounds in onion can lower blood levels of cholesterol and triglycerides, and also improve cell membrane function in red blood cells. Onion has repeatedly been shown to lower our risk of several cancers, even when we consume it in only moderate amounts. When simmered slowly in soups, onions do not lose their nutritional properties. 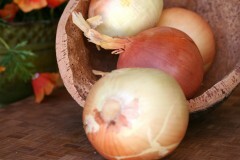 The best nutrients are found close to the skin - so, peel slightly and make onions a part of your regular diet. Here are my Top Five(w)rappers: reusable bags, cellophane, hand-stamped, Eminem and personalized. Probably everyone who reads this blog received our holiday card which included a photo from this year’s posed pic with kids and animals (it’s on the bottom right, if you’re curious).